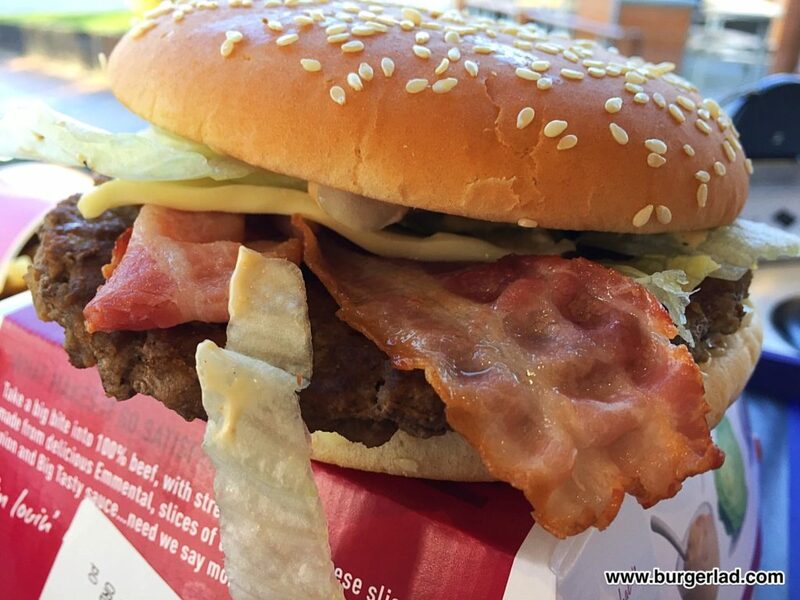 Take a big bite into 100% beef, with Beechwood smoked bacon, cheese slices made from delicious Emmental, slices of tomato, lettuce, onion and Big Tasty sauce. Price: £4.09 or £4.39 with bacon. £5.59 as part of a value meal (£5.89 with bacon), 40p extra to go large. Calories: 835 kcal for the burger only (890 kcal with bacon). 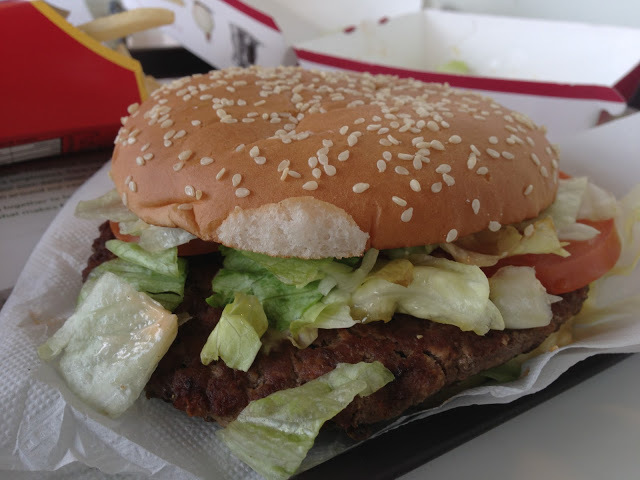 When Burger Lad® last reviewed the Big Tasty four years ago (below), he was not presented with the best build in the business and it affected the experience. 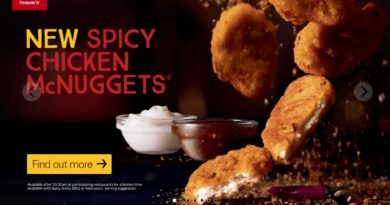 Now, granted, the build shouldn’t affect the taste much unless an ingredient actually slides out in its entirety, but as McDonald’s is realistically as much a marketing machine as a food outlet, the overall experience matters as much as the taste. So with Christmas behind us and Easter eggs already popping up in the shops, I thought it was time to reload the Big Tasty. After all, whether you like it or not, it is one of McDonalds’s most sought-after promo burgers and this is reflected in the frequency it reappears on the menu. In fact, it’s almost there every other time, in between the major promotions such as the various Great Tastes, Smokehouse and Christmas offerings. One of the McDonald’s-related questions we hear the most is “when is the Big Tasty back?” And the answer is NOW, folks. 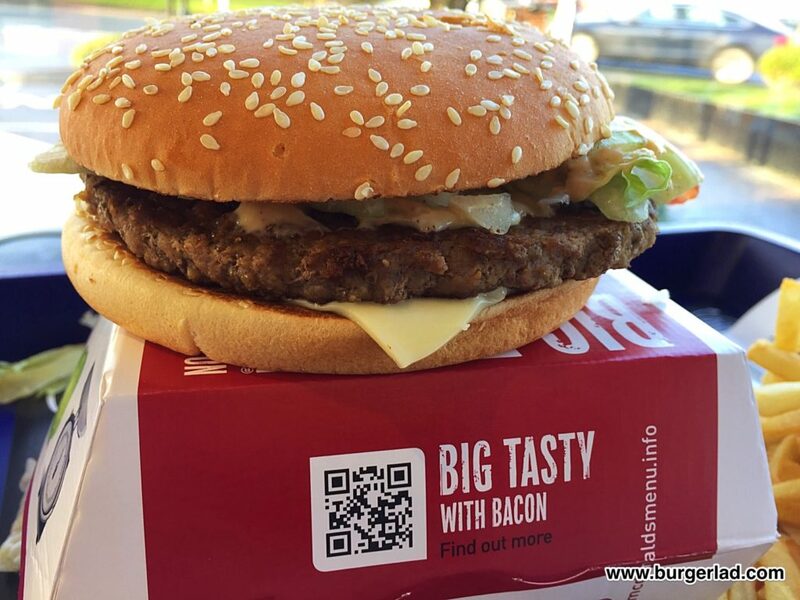 The Big Tasty is back, before you ask…! It’s a big burger. It lives up to its name. It makes the Big Mac look a bit like a slider. It comes in two guises, with or without bacon, both using the same much larger patty. It also effectively had a Christmas disguise on in 2015 when that large patty made an appearance as the Festive Feast. Today I will be having it with bacon though, because why wouldn’t you? I also ordered mine without tomato, partly because I can take or leave tomato, but also because I wanted to ensure I got a freshly made burger. So, the Big Tasty is big for a high street burger. It comes in a big box, and it feels like money well spent. When you open that special box, though, it does appear rather flat. I suspect this is more to do with the contrast with its width than it actually being flat, and if you put it side by side with a standard cheeseburger, it probably wouldn’t look so flat. 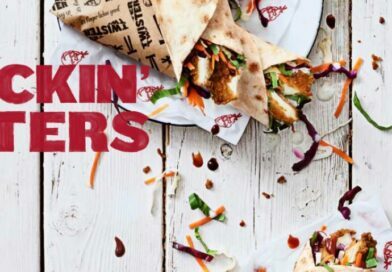 When I took mine out and got my photos done, it was clear that the build here was considerably better than the effort Burger Lad® had all these years ago. Mine had been put together with some pride, and I respect that. 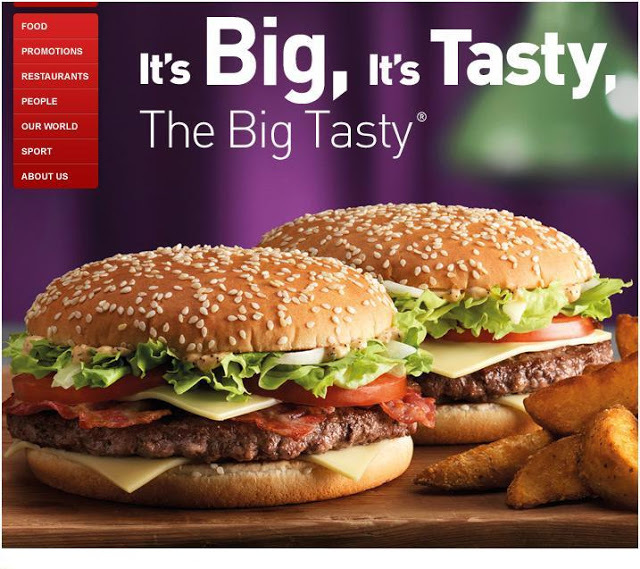 Named the Big N’ Tasty in America (which doesn’t roll off the tongue as easily as the UK name) and clearly developed to compete with another whopper-sized burger on the market, it is defined by its sauce. In this respect it is rather like the Big Mac, whose special sauce is its defining feature, and while the latter also has the aesthetic effect of that middle bun, the Big Tasty has its sheer girth. 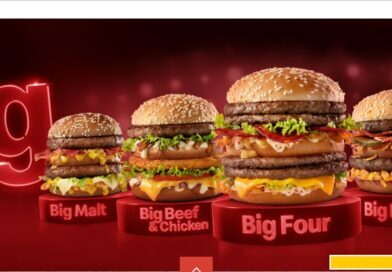 It also arguably lives up to that “big” adjective more than the Big Mac – if you see them side by side, the Big Mac looks small in comparison. The sauce has a slight smoky sourness to it. It’s not the same at all as the Big Mac and I left with an unanswered question in my head – which do I prefer? I really don’t know – which do YOU prefer, just the sauces? The bacon on this is very welcome, such that I’d genuinely feel something was missing if I didn’t have it. I felt exactly the opposite about the tomato and I think its absence allowed the sauce to shine through even more. The patty was good for McDonald’s, and you do get the sense that your money is going further – it is big, just like the build that surrounds it. It is moist, indeed Tasty and I can definitely see why it’s so popular. People clamour for it to be on the menu permanently, others say they only visit McDonald’s when the Big Tasty is on-sale. Either way it is clearly one of the most popular burgers ever at The Golden Arches. What you have is a BIG cheeseburger with a unique defining sauce, combined with artificial “exclusivity” – it is the pinnacle of modern McDonald’s marketing machine backed up by the strength of their development kitchen. I’d definitely say that you should go out and get one before it’s off the menu, but we all know it’ll be back! Happy 2017 to one and all. 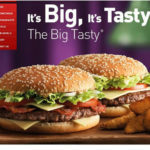 McDonald’s makes all those New Year’s resolutions go flying out the window with the return of the Big Tasty. With bold statements such as ‘It’s Big, It’s Tasty, It’s Back’ in the promotional material I thought this was some major return. But with a little bit of investigative work found that it was last on sale in the U.K. in September 2012 so did it really feel like it ever went away? 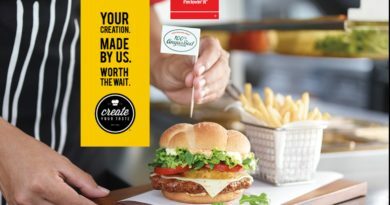 During this hiatus we’ve had the ‘Great Tastes of the World’ and ‘Festive Menu’ campaigns – so is the Big Tasty a lazy promotional item from Maccas? Having never tried one I thought this would be a good time to ‘return’ since the infamous Double Big Mac stunt. How would this New Year item appease me and is it really that big? And that tasty? Now some burger lovers may turn their nose up at the Golden Arches but we like to take you to the places some reviewers refuse to go and with the McDonald’s reviews being so popular who am I to argue with my audience? So… the return of the Big Tasty. I was once again served by the good sport who we ordered the Double Big Mac from and for a brief moment there was an exchange of mutual respect. This time there was no filming taking place and I could tell this individual was pleased by that outcome. I placed my order and the alarm bells pretty much sounded off straight away as instead of having to wait a good couple of minutes the burger was ready. How long had this been sat on the side waiting for me? Well I would say one thing about this particular experience – the burger had been put together really poorly and the presentation was very sloppy. 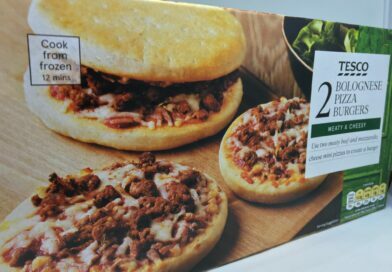 It was obvious by the way the burger sat within the packaging it had been resting at an angle as most of the cheese had ‘slipped’ out and sat firmly in the cardboard exterior. Shame. I was tempted to take it back but decided against this. So instantly I was put off. The burger was big in circumference but not thick but I was surprised how dissimilar this looked to the website photos. Now I know the burgers rarely look like their promotional counterparts but if you scan back through this blog you will see a number of McDonald’s burgers that have in fact looked pretty damn close (see The Great Tastes of the World). Anyway… there was no chance of dressing this burger up for a decent photo so I went for my first bite. 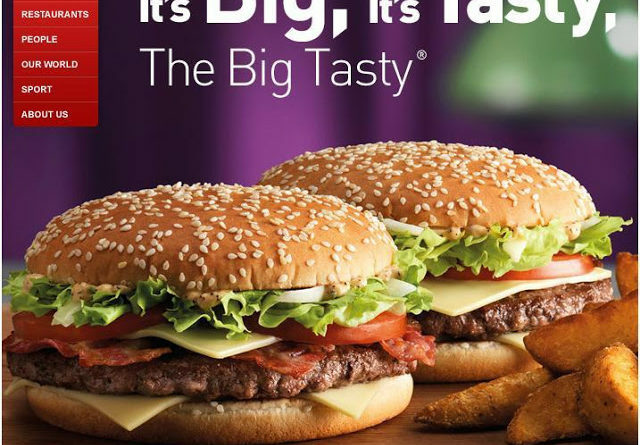 The first thing you notice about the Big Tasty is that it has a very smoky taste to it. You can taste it the whole time you are eating it and afterwards it is the lingering taste on your palate. It almost has a burnt taint to it which I found rather strange. The beef patty itself was quite sad really. I thought it was a bit dry. The Big Tasty sauce is the overwhelming flavour on offer here, it’s not unpleasant but the bacon is lost, the cheese (what was left on my burger) wasn’t distinguishable and only at my last bite did I get the sharp tang of the small chopped onion. 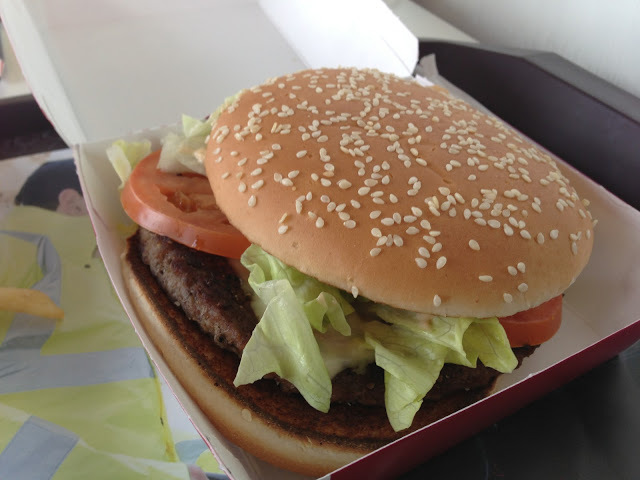 I was also unsure how this ‘Big Tasty bun’ differed from any standard seed-topped bun at McDonald’s. One of my counterparts remarked that I had been “all excited yesterday and this morning but this had dissipated by the last bite”. So while not completely unenjoyable there are certain aspects of it that will stick in my memory. I would like to give the Big Tasty a second chance but with so many char-grilled constellations in this burger-galaxy of ours I’m afraid the ‘Return of the Tasty’ may just be a one-off showing. And with that many calories I will probably pass up the opportunity should it arise again. I wonder how long this burger will remain with us and what promotional item will be next? I anticipate the next campaign to kick-off in early Spring but could be mistaken. Some people will show little or no interest in McDonalds’ next offering but for those of you that do care… we’ll be there. how could you say this about such a beautiful burger! On this day it wasn't good – I'd give it a second chance but this one had been standing around a while. If you find any good burgers please let us know! Perhaps even send us a guest review. I love this burger, actually I dig it so much that when it's on sale I have one every week. What I like the most is the huge patty and the sauce, so I think your opinion is based on taste, really. You can get bacon and cheese in practically any burger but the sauce is a different story, you can't ask for it any day of the year. 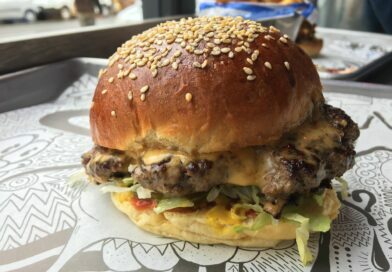 A good review but I disagree with it, I love this burger and wish that it was a permanent fixture on the menu. Thanks for reading and the comments. I agree the sauce is good but this burger had been sitting around for a while and had the dreaded "burger slide" but I would have it again. This burger made my stomach turn. Seems to be way to much sauce or something in it. Not really any meat taste. The bread also is too big if u ask me. This burger is quite frankly the Mutts Nuts – no idea why Maccies don't just leave it on their menu constantly. I agree though, the presentation often leaves a lot to be desired. I am a fan of the Big Tasty and was very disappointed when it disappeared. 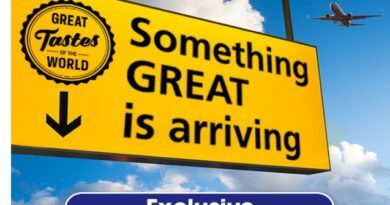 News of it's return is welcome indeed. I fear you did not have the best introduction to the BT. Give it another try, if only to show a bit if scientific rigour. Never been a fan of the Big Tasty. Much prefer the BCO as a regular McDonalds promotion. Speaking of promotions, do you guys know when Coke Glasses will be back? Swear they didn't do them last year, always my favourite promotion. Dam i wish our restaurants was like yours!! Just returned from the Drakehouse, Sheffield restaurant where I ordered the Big Tasty Large meal with bacon, Was all freshly cooked but to my dismay when I started to eat the burger found no bacon in it at all. 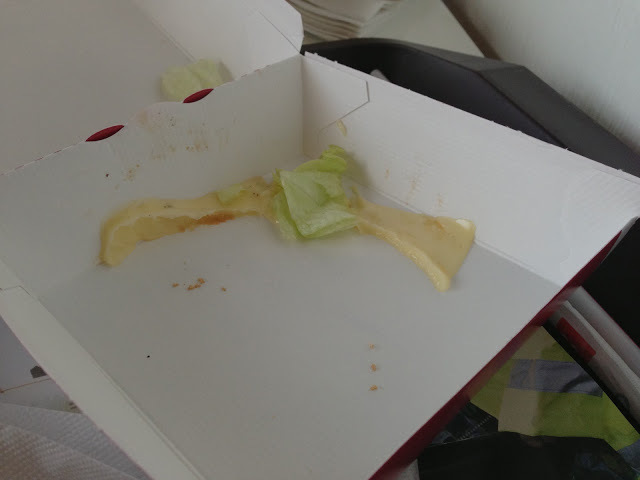 There was nothing on the box to identify with or without bacon so because I had already started to consume the burger and not wishing to cause unnecessary embarrassment consumed the rest and left, never to return again…. Thank you for nothing!. 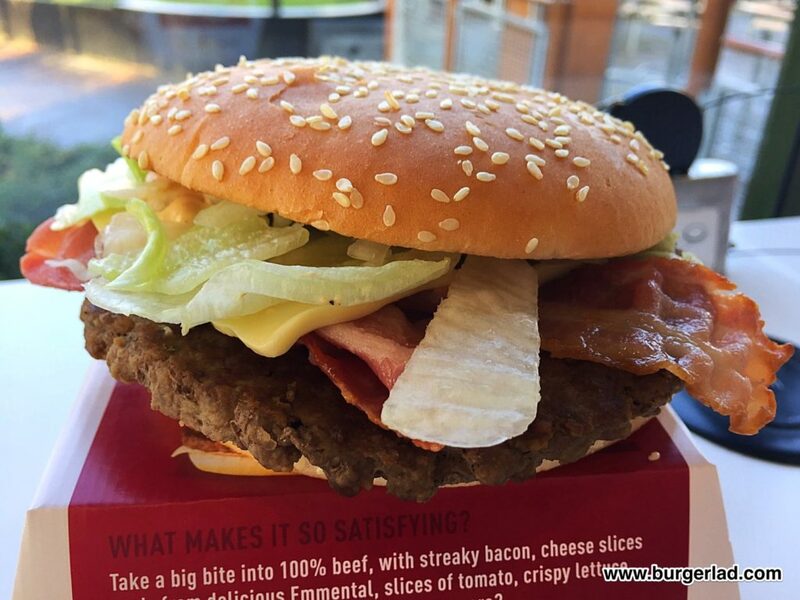 Try the Big Tasty without the sauce and bacon. I think your be in for a pleasant surprise! I’m unsure if this burger is 100% ground beef without some added seasoning. It’s a gorgeous burger and one of the best McDonald’s serve. I personally hate the big tasty sauce. I think it ruins this burger. I would love to know what they season this burger with. So, I ordered a big tasty, which was full of deliciousness! It watered my mouth as expected but a kol zobi shayaan was located within the beef. I will not allow this to happen again! Like for help, please! How much is a big tasty meal(standard) because the price changes every time I go there! Getting fed up with it now, also if I wanted a large meal I’d dam well ask for it, ok.. The first burger was great. I could taste the beef. The second and third were awful. Un-trained workers put far too much sauce on the burger. My hands were bathed in sauce. Lazy workers turn a wonderful product into an awful product.